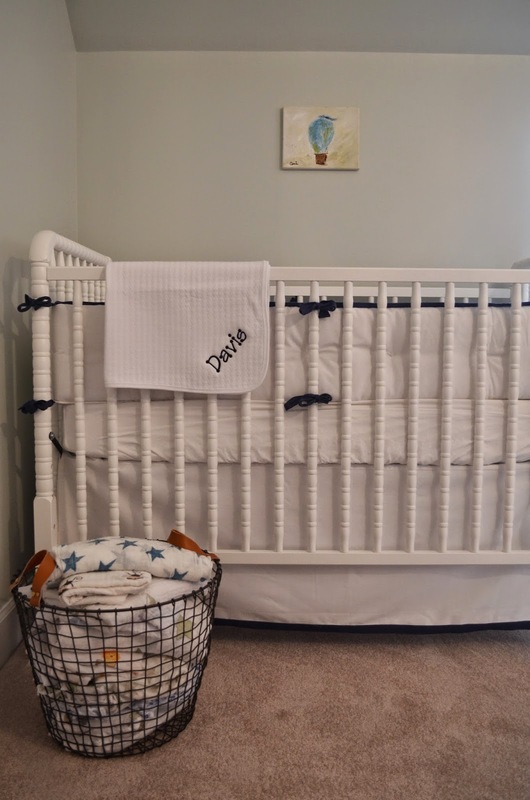 I have had an absolute ball doing this nursery. My very first twin baby room. It has been such a fun project to work with this mama-to-be, who happens to be a dear friend. 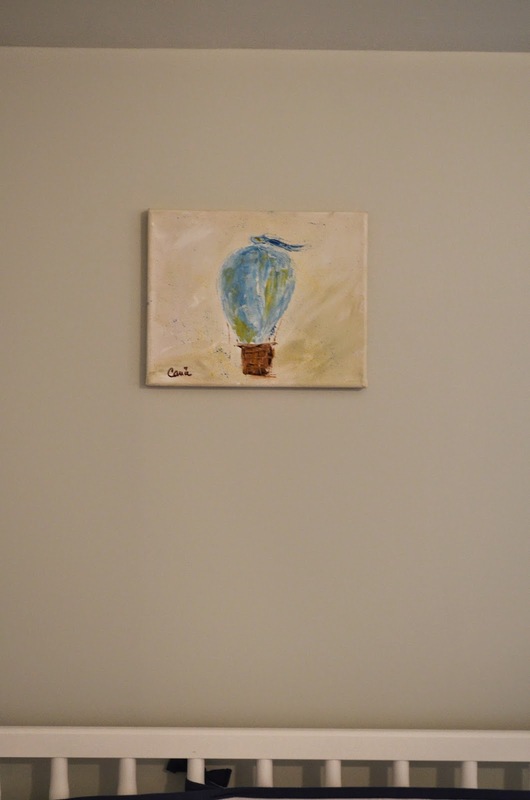 She and I totally clicked with the concept and look of this room. 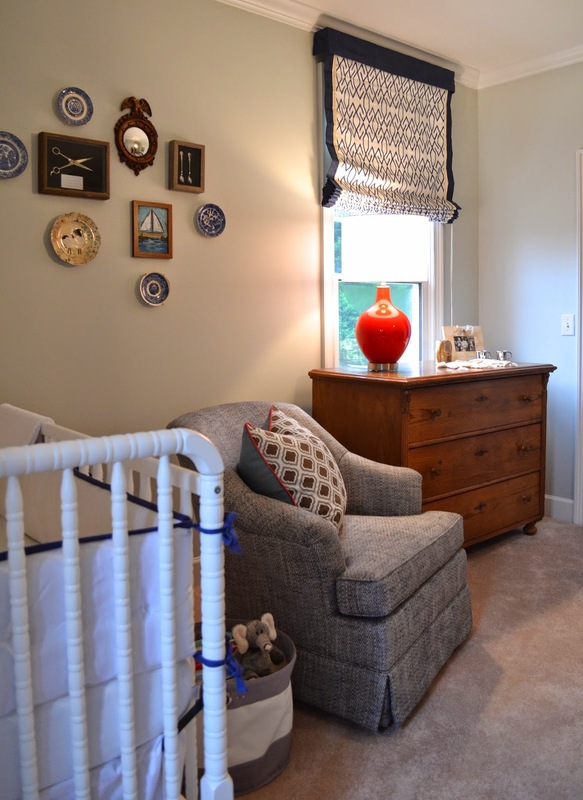 It needed to be soft for baby, sophisticated enough for them to use for a long time, and to connect with the rest of the home. She and I both love a mix of old and new, and this room really represents that combo. The glossy white, classic Jenny Lind beds with crisp white and navy pique baby bedding….the antique pine chest with poppy red lamp….the classic brass lantern…and that daybed. Ahhhh, the day bed. A palette of soft blue, navy, and white was the basis of our plan, with a pop of red and a splash of gold and brass….complete with a little pattern play with pillows. An empty dormer begged for a cubby and window seat. 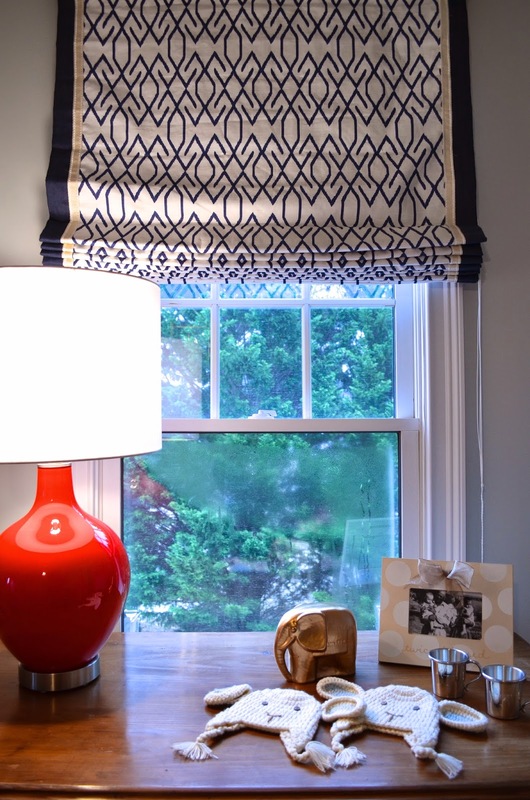 I had blackout roman shades made for both windows – nothing looks more crisp! The best part of this whole room?!?! Everything comes in TWOS! Some of my favorite details ever – contrast welt on the cushion and pillow, and a gold exposed zipper. Love love love. 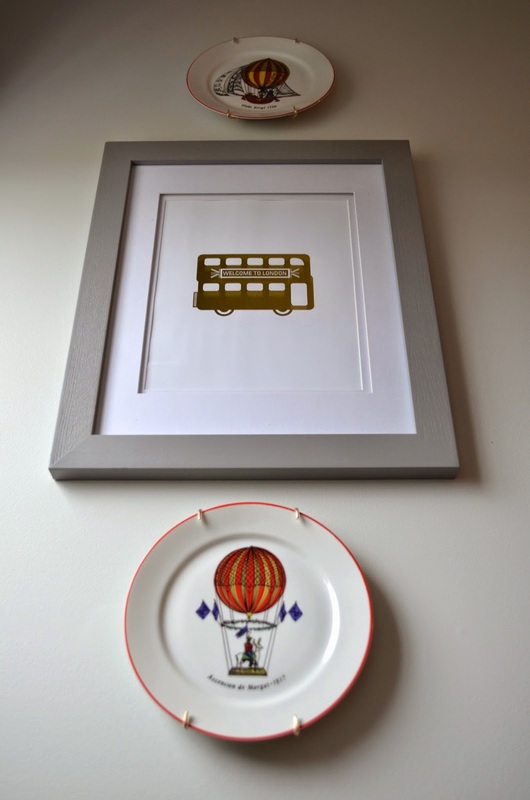 We added a few British elements to the room to keep things preppy and fun via plates and prints. 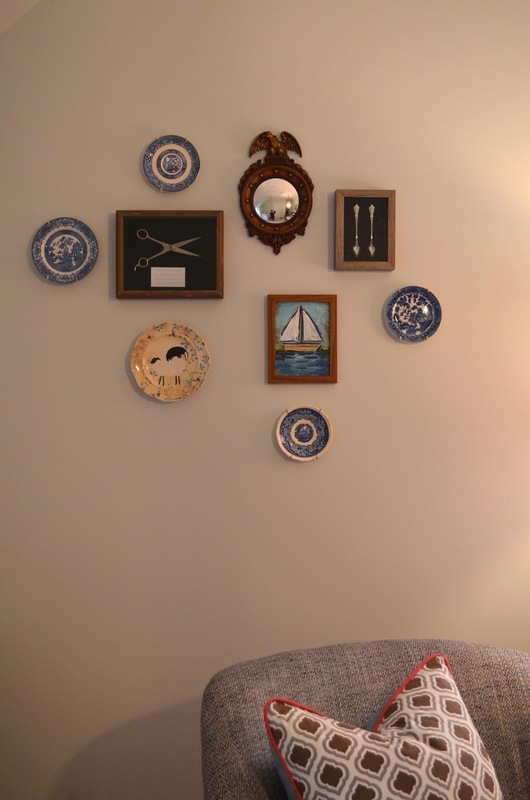 The mommy loves antique blue and white (she’s in good company, right!?!) and we had a few special pieces to mix with the plates she had gathered. 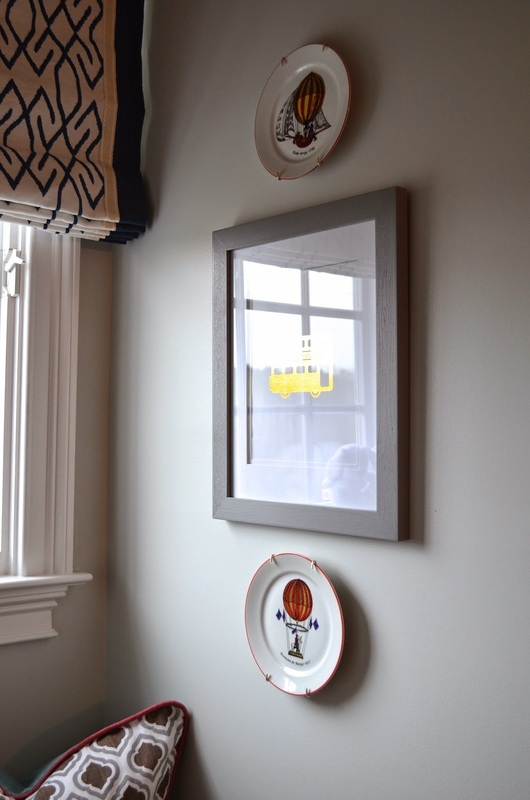 I love a touch of a gallery wall to showcase those meaningful pieces. 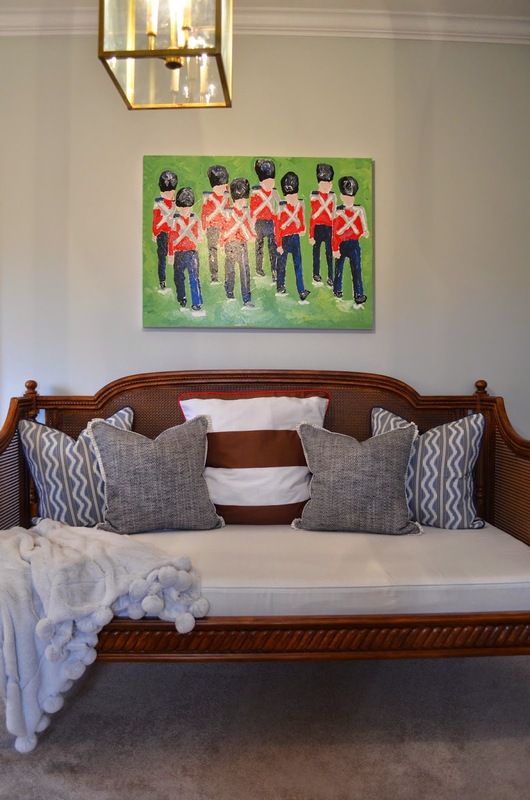 Over the fabulous caned daybed, we placed a standout piece: a custom painting of marching British soldiers. Every little boy loves a soldier, right? Blue, cream, white, and chocolate pillows beg for cuddle time! And I love the abstract quality of the painting…shades of blues, green, red and white….muddled together to form little marching soldiers. 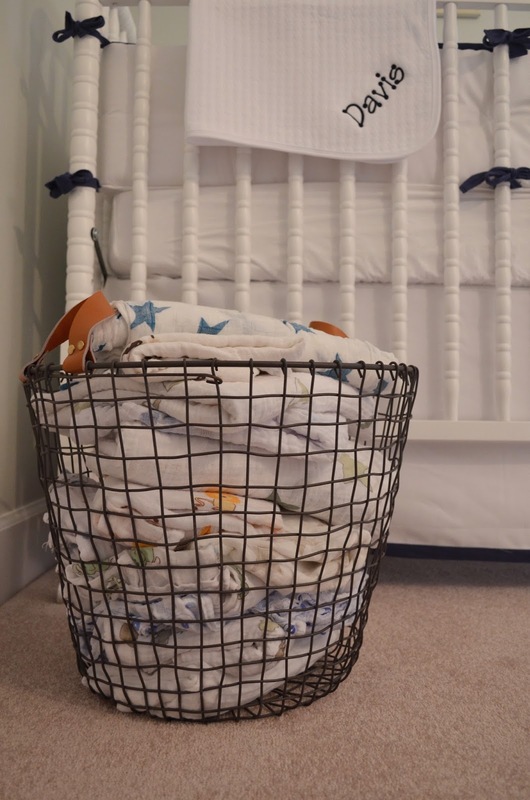 The twins are all set, and we are waiting for them to arrive any day now. Praying for a fast and easy delivery for babies and mommy too! 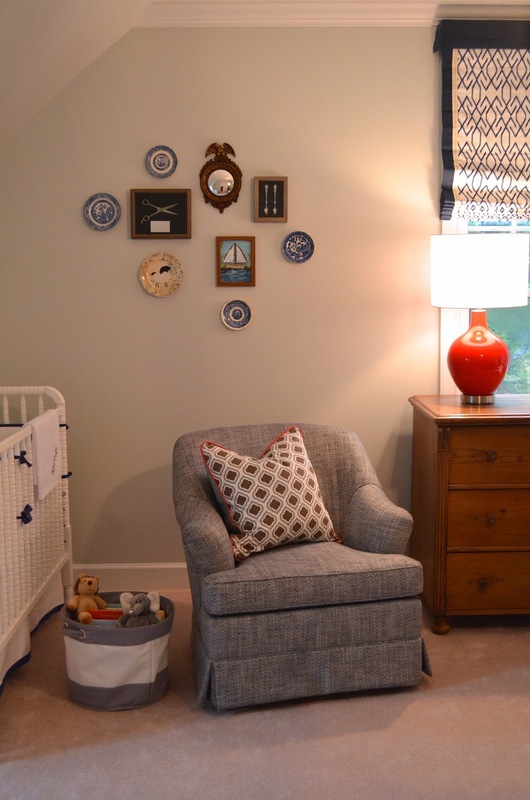 Their little baby things make for the sweetest pieces to use in staging the room. 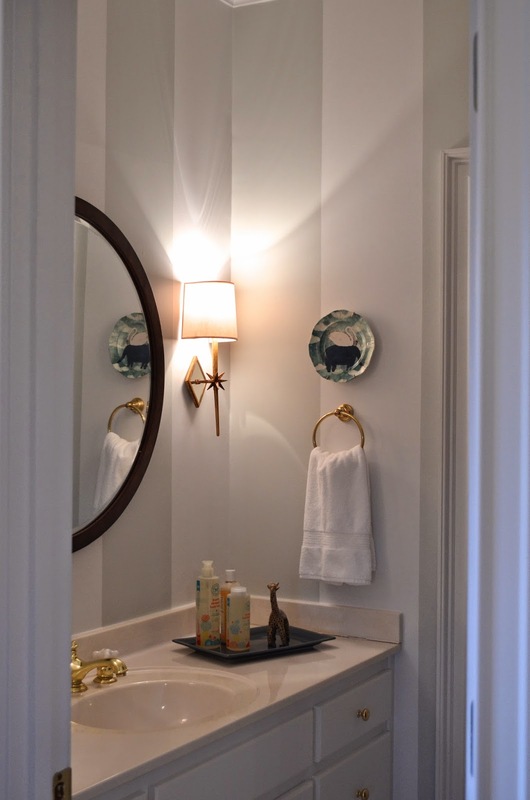 The adjacent bathroom needed a maja fluff (think navy floral wallpaper) and we worked with the existing space plan and vanity. 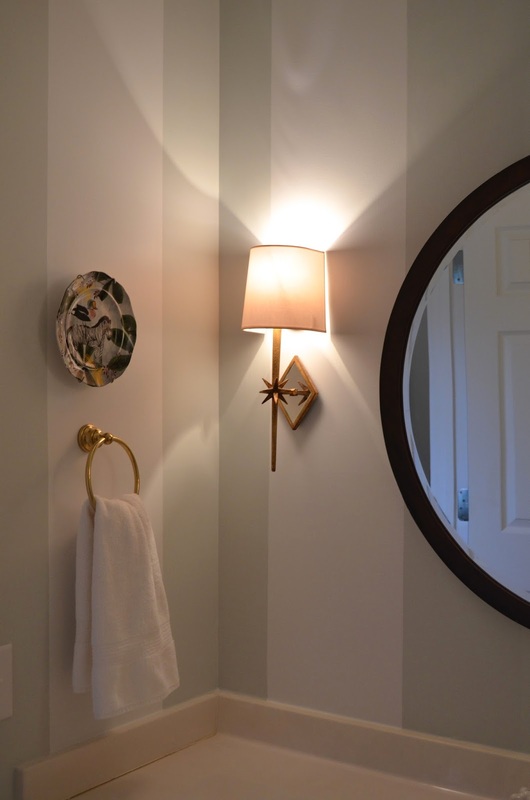 Wide stripes carry the eye upward, while the round mirror pops on the wall. 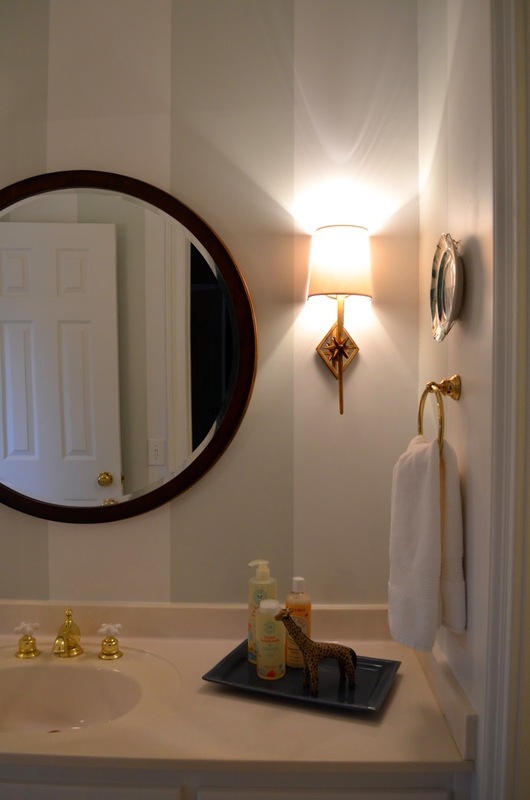 Antique brass wall sconce pull together the gold faucet and knobs. 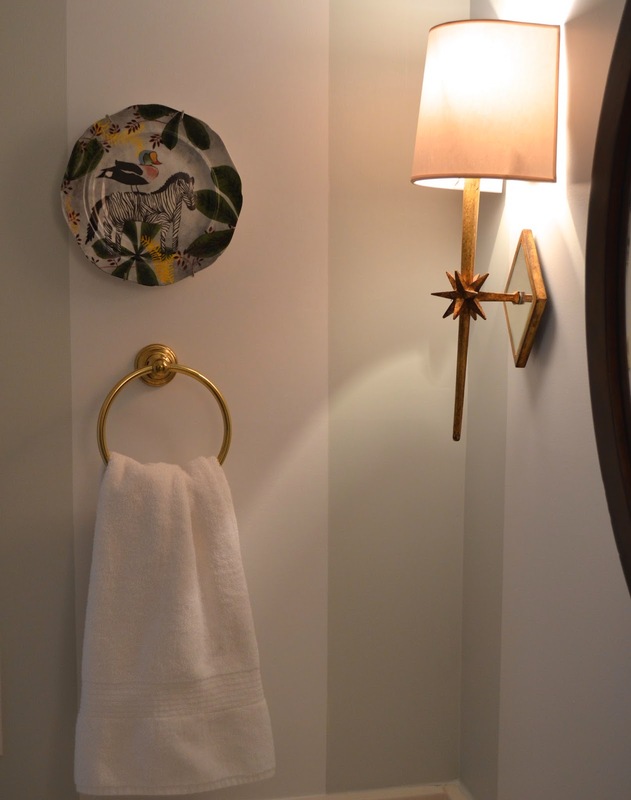 I think I love the way the bathroom transformed as much as the bedroom itself!